Kids find extreme weather and natural disasters fascinating -- grab their attention by teaching them about tornadoes, a topic that is captivating and leads to independent exploration about the destructive forces that shape our world. 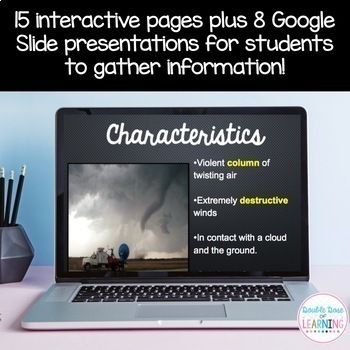 Utilize Google Classroom and open the entire resource in Google Slides to present information about tornadoes in an interactive, digital format that can be easily differentiated for all learners. 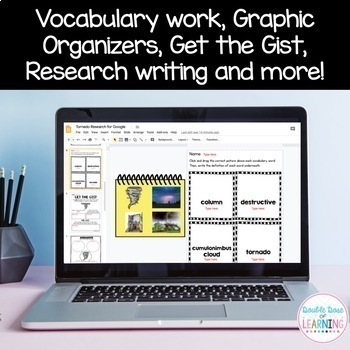 Note: This product can be used through Google Classroom, Google Drive, or can be shared through a link on a PC, Mac or Chromebook. Full directions are included in a PDF file with this purchase. 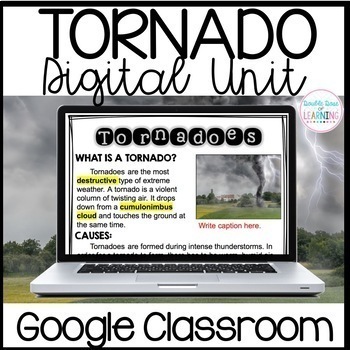 This digital resource can be used as a stand alone unit or as a companion to the paper version of Tornado Research Unit found within the Extreme Weather and Natural Disasters Pocketbook. 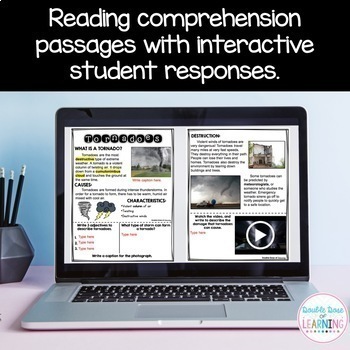 The paper versions include full detailed lesson plans, anchor charts, and many more additional resources and activities to supplement learning (60 pages). Check out our other Extreme Weather Research Units for Google! ...or, our **PRINTABLE**Extreme Weather Research Units with additional resources added!